It’s one thing to be in the news and another thing to be in the news in Pakistan! Then to have it happen on International Women’s Day! We also had another unplanned event as it happened to be the birthday of one the GRM donors who helped GRM build this very center. God is so amazing! We did not plan it this way. We were on Skype along with our secretary to witness this event. All of us were so touched to see women that we had seen in the brick fields not more than 4 months ago now set FREE and now graduating from our center. To observe them in the transition from making bricks 12 hours a day to making beautiful garments is a joy and a wonder to us. This is such a joy because we know that this is the first time they have been honored in their entire lives. Up to this point they have only known shame. We give them a meal, message, a sewing machine and a certificate in their honor. They BEAM with happiness! It’s hard to tell that they once were slaves. It is also a wonder to us to think of God’s calling! How He uses organizations and people from another country such as GRM and YOU (our co-laborers in the gospel) to set these abused and neglected women FREE, train them to become a seamstress, and play a role in getting them jobs. Why were we chosen? Were others called but refused to answer? We are always deeply humbled and thankful to the Lord for this privilege. Through the power of modern technology we get to witness these miracles thousands of miles away in real time. These are exciting times in missions and GRM! The graduation appeared in EVERY major city of Pakistan! One city alone consists of 15 million. We’re told that major newspapers put their papers on the internet multiplying the reading audience throughout the Middle East. This reminds me of Daniel receiving favor in Babylon. When the Lord is in something no power can restrain Him. We recognize the one behind it all and give Him praise, honor, and glory for the great things He has done through His people. As you read this article from my heart and see the newspaper clippings below, will you say a prayer for us? Your prayers are needed! Intercessors play a key role in this great adventure. Givers are also urgently needed to sow into this fertile ground. For as God gives favor, we must expand. Our critical need at this time is one more center to handle the many applicants on the waiting list! This will cost us about $4,000. Will you help us today with the best gift you can give? Maybe you have stored away a tithe to the Lord. This is a gift that will keep on giving until Jesus comes. 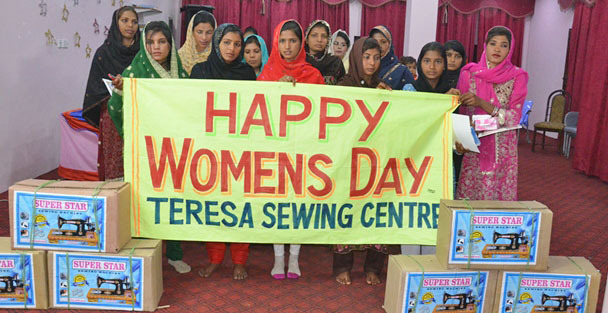 Our current centers graduate 123 seamstress missionaries a year. They will all tithe and give to help other prisoners for a lifetime. Please feel free to call us at anytime @ 800-309-0133. “I was very honored to be able to watch the ladies graduate from Teresa Sewing Center via Skype at the GRM office on March 8, 2018! I was moved to tears as I saw the expressions on their faces. Some didn’t seem to know how to let themselves be free to enjoy what they’ve accomplished. Some were smiling from ear to ear. Some were laughing with excitement. But what a day of celebration! It happened to be National Women’s Day and along with the graduation, they were able to have a meal and cake!